I love scrapbooking supplies, don’t you? Finding the right supplies can definitely inspire me to scrapbook. If something doesn’t inspire me, then I am not going to sit down and do any scrapbooking. That is why I am always on the lookout for supplies that will inspire me to scrapbook my older photos. My family history photos. For me, sometimes thinking about scrapbooking old photos is not as exciting as scrapbooking the pictures of my own children that I love and adore. So, I need some extra incentive to get me going. At the beginning of 2011, it seems that Bo Bunny created a line that is perfect for inspiring someone to scrapbook old family photos. It is their line, titled: Timepiece. The colors alone are perfect for heritage scrapbooking. This is something I struggle with. Finding color palettes I love in the vintage papers. I love these. This line is made up of cremes, blacks, and reds. A perfect combo that will fit perfectly with both black and white and colored photos. I love the title of this line too. It speaks perfectly to what heritage scrapbooking is all about. Capturing a moment in time. There is the theme of old pocket watches running throughout this line which is reminiscent of a time long ago, and capturing a moment in time. While I can’t read the designers mind when they were creating this line, I can’t help but think that they had some of these same themes in mind. There are old keys on many of the papers as well, which I think would be perfect for symbolizing “unlocking the past”. There are cutouts that carry phrases such as, “Keys to the past, unlock doors to the future” and “Portraits of the Past” and “Here is where our story begins”. Think of the beautiful pages you could create with these types of themes. There are custom stickers that speak of family, fathers, and generations. There are roman numeral stickers for your dates and places, and there are chipboard tags with beautiful fonts spelling out family titles like Grandmother and Grandfather, and Great-Grandmother and Great-Grandfather. 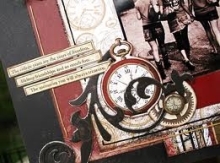 This scrapbooking line is perfect for the heritage scrapbooking enthusiast, or for the average person like me who is looking for a little inspiration to get going on scrapbooking my family history. With trinkets, ribbon, and clocks that all coordinate beautifully, you can’t help but be inspired. And, I think this line would be perfect for a project like this too.